"The Yamaha YDP 140 is an entry level digital piano that's well built, reliable and a great choice for anyone looking to learn the piano at an affordable price." MSRP: Est. $999. Price may vary. More voices would have been nice. 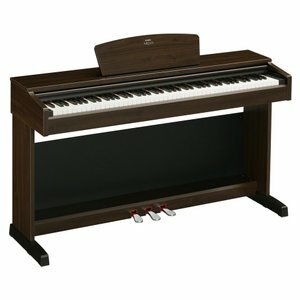 The Yamaha YDP 140 is one of Yamaha's newest entry level digital piano in their Arius/YDP lineup. The YDP 140 comes with a full size 88 weighted Graded Hammer Standard keyboard, 64 notes of polyphony, and a built-in recording feature to name a few features. First things first: this new digital piano is known as the Arius YDP 140. Why? We're really not sure. For one thing, other YDPs such as the YDP223 and YDP131C aren't marketed with the Arius name. For this review, we'll keep it simple and call it the YDP 140 from here on. Although the Yamaha YDP 140 comes with only six total voices, the voices are what you can expect from Yamaha—of high quality and attention. The grand piano voices are great and both have been sampled at three different velocity levels giving a very realistic sounding piano. We liked the electric piano and harpsichord voices too. We especially liked the realistic key-off samples that are programmed into the harpsichord voice. The YDP 140 can operate in dual mode which is pretty cool because you can layer any of the six voices together to create some great textures. Layering piano with strings or acoustic piano with electric piano are only a few examples of possible combinations. The YDP140 is a full sized 88 weighted keyboard with GHS (Graded Hammer Standard). The GHS keyboard mimics the feel of an acoustic grand piano by feeling heavier on the lower notes while becoming progressively lighter on the higher notes. We really loved how this keyboard felt and highly recommend it for students and musicians who want the feel of an acoustic piano in a digital piano package. The YDP 140 also comes with a MIDI sequencer which allows you to record your compositions. The one track recorder is straightforward to use and will store up to 100 KB of data (about 11,000 notes). The YDP140 has both MIDI IN and MIDI OUT connections for interfacing with a computer, synthesizer or any other MIDI capable device. The Yamaha YDP140 comes with a reverb effects processor for adding depth, "50 greats for the piano" music built into it along with the accompanying sheet music. And, depending on your locale, the YDP 140 will also include a bench and AC power adapter (check with your Yamaha dealer to make sure). All in all, we liked the YDP 140—it has a wonderful 3-level grand piano (plus 5 other voices), a great feeling keyboard, a sequencer for recording performances, and the ability to layer voices. That's really all there is to it and that's ok. This is an entry level digital piano that's well built, reliable and a great choice for anyone looking to learn the piano at an affordable price.